March Madness ended earlier this week, which means that we all had the chance to look over our brackets and see just how well we did. 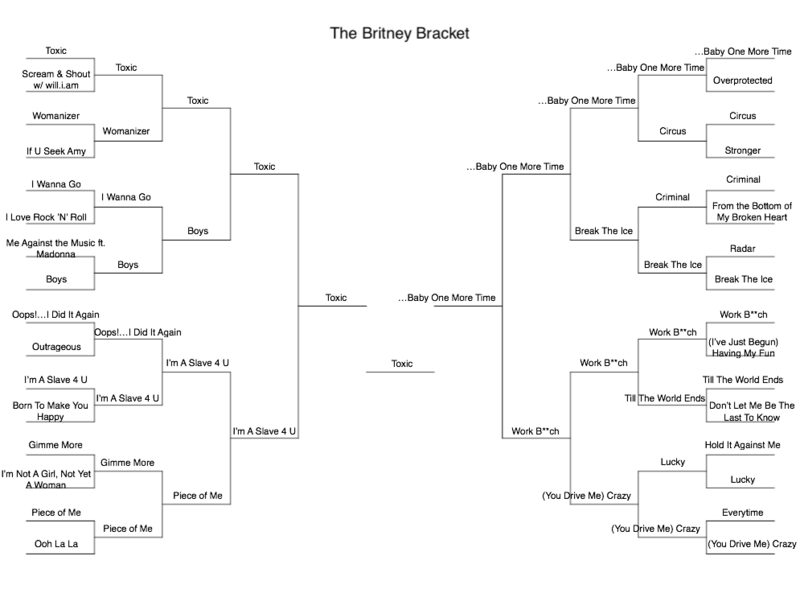 Over at WUSC, we looked back on our brackets to see just how much our personal opinions matched up with the popular vote of favorite Britney Spears songs. During the past month at WUSC, DJs and friends participated in The Britney Bracket, in which 32 of the pop queen’s most iconic songs were set up to compete with each other. We got the chance to ultimately decide amongst ourselves as to which song was truly her best. Maybe her best is yet to come, or maybe it will always be “Toxic”, Britney’s 2003 anthem, which was voted to be our collective favorite of hers. Only one song, “I’m a Slave 4 U,” made it past the first round with absolutely no votes cast against it. After an upset win over “Oops!… I Did It Again,” it was finally knocked out against “Toxic,” which won it all. Iconic songs such as “If U Seek Amy” and “Radar” put up a great fight, but ended up losing in the first round by just a few votes. Any songs that you think should have made it farther? Any songs that you think should’ve been included in the bracket, but don’t see on here? Let us know by contacting our Music Office!